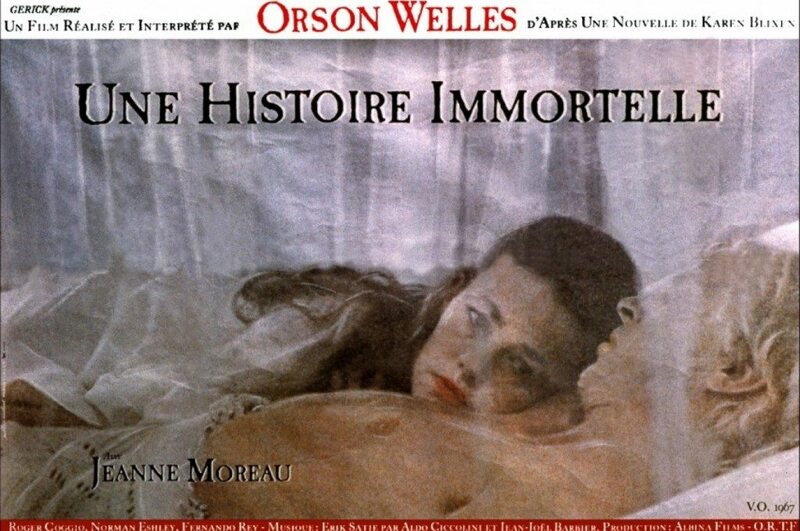 If “The Immortal Story” (1968) has often gone overlooked in Orson Welles's filmography, it's easy to understand why. His first color feature is certainly not his best work and it's easily eclipsed by twin masterpieces surrounding it: “Chimes at Midnight” (1965) and “F For Fake” (1973). While both of those films display Welles at his most stylistically audacious, “The Immortal Story” finds Welles in a more sedate mood, content to showcase his performers and the soft lighting of cinematographer Willy Kurant with only the occasional editing flourishes. Perhaps Welles felt obliged to be as faithful as possible to the source short story by his 20th-century idol Isak Dinesen, the pen name of Danish author Karen Blixen. Welles identified closely with the iconoclastic baroness and spent a significant portion of his career planning to adapt several of her works; “The Immortal Story” would be the only completed feature. Then again, Welles venerated Shakespeare too and had no problem transforming the Bard's work into pure Wellesian prestidigitation, so perhaps the director simply felt a more minimalist style appropriate to this particular material, or maybe he was influenced by the fact that “The Immortal Story” was planned for release on French televison. Welles portrays Mr. Clay, an aging financier who has had little time in his life for anything but business: not friends, not lovers, not a family, not even hobbies as he counts out his dwindling days in late-19th-century Macao. Caked with makeup to add a few decades, the hefty Welles works his massive frame and his sweaty jowls tat droop as much as his fake mustache to great effect, embodying a man who looks exhausted even by sitting in a chair in his lonely mansion, much of which was filmed in Welles's own estate near Madrid. It's almost like Welles had previous experience playing much older business tycoons who find themselves alone with their worldly belongings. Clay's only companion is bookkeeper Elishama Levinsky (Roger Coggio), charged with entertaining his boss by reading to him from the company's account books. One sleepless night, the gout-ridden Clay startles Levinsky by asking him to read something fresh, prompting the clerk to recite a verse from the book of Isaiah. Clay bellows that he has no use for prophecy, and can't understand why anyone would waste their time recording events that hadn't really happened. Bored and restless, Clay rambles on about one story he knows, perhaps the only story he knows, a tale of a wealthy old man who hires a young sailor to impregnate his wife in order to produce an heir for his fortunes. Levinsky notes that everyone has heard this particular legend, but the dictatorial Clay decides he wants to transform this legend into reality for himself because otherwise it would indeed just be... a story. Clay is not dissuaded by the fact that he doesn't even have a wife, trusting that his money will buy him all the control that he needs. Dinesen's premise explored the unpredictable nature of storytelling, a subject near and dear to Welles's heart. Clay's money makes people listen, but each of his players has their own agenda, including his trusted employee. The prospective wife Virginie (Jeanne Moreau) accedes in part because of the cold hard cash, but also because Clay lives in her childhood home, one he wrested from her father, the former business partner Clay callously betrayed. Peroxide blond sailor Paul (newcomer Norman Eshley) indicates from the start that he won't comply meekly, refusing to accept a ride in Clay's carriage, preferring to run just behind on his own. If Paul and Virginie consummate the deal, it will be mostly for their own reasons, not Clay's egotistical scheme. Like many great artists, Welles preferred to control as many aspects of production as he could, but unlike Dinesen, merely taking pen to paper (or dictating to her assistant), the director had to rely on many other people to complete his work. It's easy enough to read the film as an expression of both the challenges and rewards of working with actors and crew: they don't always do what they're told, but sometimes that intransigence produces a pleasant surprise. It's equally tempting to see a reflection of Welles's constant struggles to secure financing for his many ambitions; the last few decades of his career, mostly spent in Europe, were marked by projects that had to be abandoned when questionable backers failed to deliver on promises. Perhaps Welles took pleasure in depicting Clay's ample resources as insufficient to guarantee him the ability to tug on all the puppet strings. The film feels as if it's suspended in time, unfolding slowly in its own pocket universe, the various characters never really all quite together. After all, each considers themselves the main character in the story. Willy Kurant's soft lighting and unobtrusive hand-held camerawork suffuses the film with a quiet melancholy. This effect is underscored by the film's exquisite sound design, a symphony of chirping crickets and gentle piano music from Erik Satie. Despite the languid pace, the film ends in less than an hour, and one suspects that the various players in this psychodrama will look back on it all and wonder if it really happened. The film is presented in its original 1.66:1 aspect ratio and is sourced from a recent restoration “undertaken in 2K resolution at Eclair/Groupe Ymagis by Gaumont, with the support of the CNC.” This 1080p transfer doesn't blow you away with rich colors or razor-sharp image quality like some top-end Criterion transfers, but it looks really great here in an unassuming way. Interiors showcase Kurant's delicate lighting scheme with exteriors looking brighter and more vibrant than Clay's sad little home. A very soft grain structure enhances the look. The LPCM mono audio is crisp if rather flat. Dialogue was dubbed in post-production but doesn't have the tinny, disembodied quality that, say, many Italian films of this era do. The film's audio design is brilliant but subtle, and this lossless sound highlights both the gentle Satie music and the equally gentle music of the chirping crickets. Optional English subtitles support the audio in both the English and French-language versions. The viewer's first choice is between the film's English-language version (58 min.) and the French-language version (50 min.) Dialogue for both was dubbed, and each is an equally “correct” version. The English version is accompanied an optional commentary track, recorded in 2009 by the great film critic Adrian Martin. Martin is one of my favorite film scholars, and it's not surprising that his commentary is top-notch. 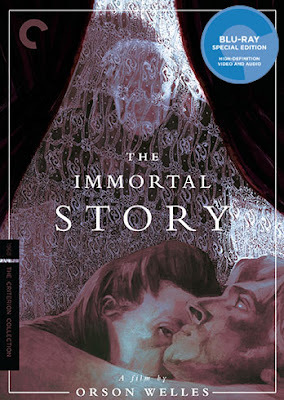 I was, however, surprised by his claim that “The Immortal Story” has proven to be a greatly influential film, helping to shape movies such as Kubrick's “Barry Lyndon,” Scorsese's “The Age Of Innocence” and many films by Raul Ruiz and Manoel de Oliveira. While the similarities are clear, I don't think of “The Immortal Story” as the first film to adopt such a style, but I trust Martin's expertise in the matter and will delve more deeply into the subject in the near future. The main extra on the disc is a lively documentary about Orson Welles (1968, 43 min.) directed by Francois Reichenbach and Frederic Rossif. This digressive, aggressive documentary is equal parts irritating and fascinating, and after my early annoyance with it, I found myself drawn in completely. It's a bizarrely structured and edited love letter to Welles, more as a great raconteur than as a great filmmaker. We're treated to about three minutes of Welles explaining his secret to mixing the perfect salad, and darned if it isn't engaging. He tells an array of great stories. One of my favorites is his mockery of Winston Churchill's fondness for “lowbrow” movies – Welles's examples is “That Hamilton Woman” (a Criterion Collection entry, by the way) which he describes as “an awful film” that made Churchill cry every time. At one point, Welles promises that his “Don Quixote” project is just a few weeks from completion. Anyway, this is great. The disc also includes interviews with cinematographer Willy Kurant (2004, 15 min.) and actor Norman Eshley (2016, 14 min.) Eshley talks about receiving a call for a mysterious audition that suddenly resulted in his first film role being directed by Orson Welles and mostly involving being in bed with Jeanne Moreau. Nice work if you can get it. 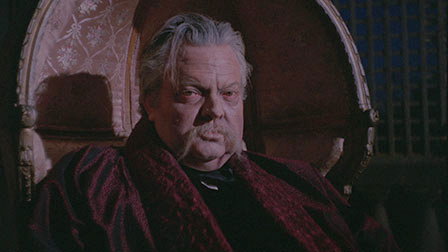 He also tells a stunning story about an offer Welles made to him... I'll let you discover that for yourself. We also get an interview with Welles scholar Francois Thomas (2016, 25 min.) who provides details about the film's production for the television channel France 2 and the ways in which Welles slyly steered the production to his home near Madrid. The slim fold-out insert booklet includes an essay from critic Jonathan Rosenbaum. Rosenbaum and Martin in the same Criterion volume – Movie Mutants unite! The late “European phase” of Welles's career was marked by a series of projects abandoned at various stages of production because of unreliable funding. “The Immortal Story” is one of the few features completed during this time, and teases us with a glimpse of the many films that might have been. As far as I know, this is the film's first high-def release in North America and it's a very good one.